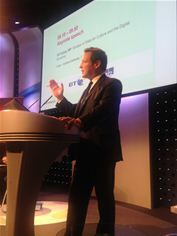 16th July 2015: Launched today by Digital Economy Minister Ed Vaizey, at Reform’s ‘Cyber security: assurance, resilience, response’ conference, the Inspired Careers website (www.inspiredcareers.org) has been designed to help address the cyber security skills shortage by attracting new people into the industry and providing professional career paths and opportunities. The site has been developed with funding from the Department for Culture, Media and Sport (DCMS) as part of the UK Government’s National Cyber Security Programme, with the support of CREST, the not for profit body that represents the technical information assurance industry. Inspired Careers offers ‘day in the life’ filmed interviews; internship, apprenticeship, work experience and more senior level vacancies; academic and professional courses and certifications; social media resources, whitepapers and suggestions on next careers choices. All of the information and expert advice is presented in a clear and manageable way to help people make informed decisions. The UK cyber security industry employs an estimated 40,000 people and this is expected to grow significantly in coming years. Employers are being encouraged to publicise internship and other work based training on the site to give students the opportunity to experience real-world cyber security work. This will also help to address demand for high calibre future recruits by giving them the knowledge and practical experience they need.